valves. The pitch is generally not less than 1 inch for every 10 feet. The piping arrangements for a new system should provide for draining the entire system. The radiator transfers heat from the hot water in the pipes of a hot-water heating system into the surrounding air in a room. A radiator is usually of two types. Cast-iron radiators are constructed and assembled in sections, as shown in figure 4-68, view A. Damaged radiator sections can be replaced without replacing the entire radiator assembly. Fin-tube radiators (fig. 4-68, view B) are constructed of steel pipe and fins, which are welded to the pipe. Radiators usually rest on the floor. However, they can be either mounted on a wall or hung from the ceiling. The location of a radiator depends on the type of room to be heated and its location with respect to the location of the boiler. For instance, in a forced- circulation hot-water distribution system, the radiators may be on the same level with the boiler. Convectors are supported on the wall much in the same way as a pipe. The convectors consist of a fin-tube radiator mounted in a metal cabinet and transfer heat much in the same way, although a damaged section must be welded or the entire convector must be replaced (fig. 4-68, view C). Hot-water heating system radiators and high points in the distribution lines must have some type of vent that releases air from the system. Air trapped in the system prevents the circulation of water. For this purpose, a manually operated key-type air vent, as shown in figure 4-69, can be used. 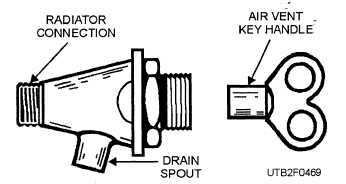 Manually operated key-type air vents can be replaced by automatic air vents. One type of automatic air vent is shown in figure 4-70. It automatically allows the air that forms in the system to escape. When air vents fail, replace them. Radiators also have shutoff valves, as shown in figure 4-71, which reduce or stop the flow of hot water through a radiator. They are installed in the piping next to the inlet side of the radiator. Occasionally, you must tighten the packing nut on these valves to prevent the water from leaking around the valve stem. Figure 4-68. - Radiators: A. Cast iron; B. Fin tube; C. Convector. Figure 4-69. - A manually operated key-type air vent.